The end of June 2018 marks one year since we packed up and moved to State College, PA to work at Penn State. It has been a great, and very busy, year meeting new colleagues, staff, and students. I’ve have really enjoyed becoming a part of the Bellisario College of Communications, the Science Communication Program, the Media Effects Research Lab, and the Media Psychology Research Group. 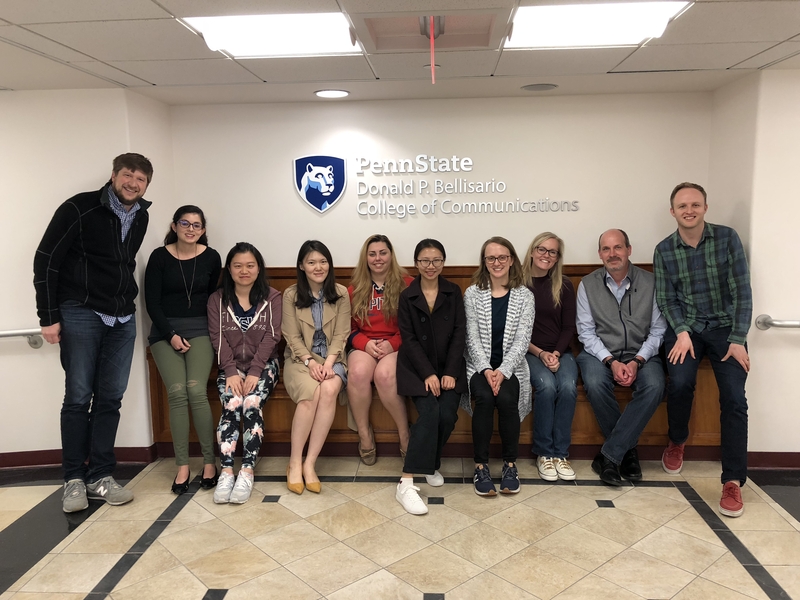 These programs are doing so much great work researching, teaching, and informing the public about the role of communications and media in our society. 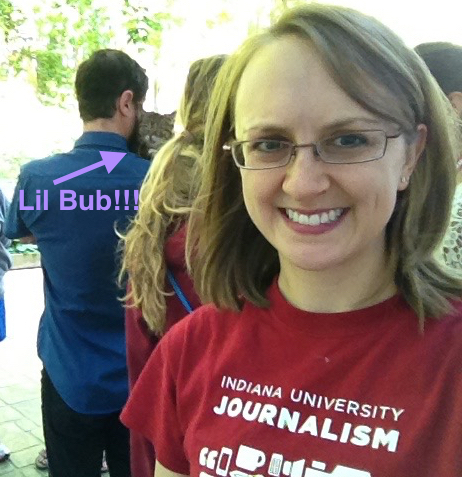 I am also particularly grateful for the wonderful interdisciplinary opportunities I have experienced in the past year. From faculty networking meetings with colleagues in the Department of Communication Arts and Sciences to meeting the folks at the Institutes of Energy and the Environment and conversations with people from multiple departments who study public health, I have learned a lot from others and can’t wait to continue connecting with more Nittany Lions. 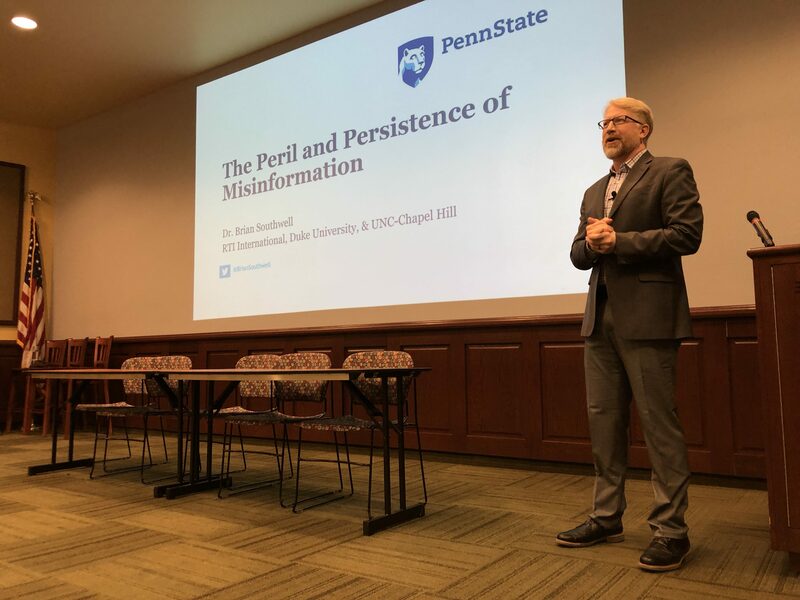 Now that I’m settled in Happy Valley, my goal is to post more frequently about all the exciting research and outreach going on here at Penn State. Stay tuned! In the meantime, below are a few pictures from events during the 2017-2018 academic year at PSU. 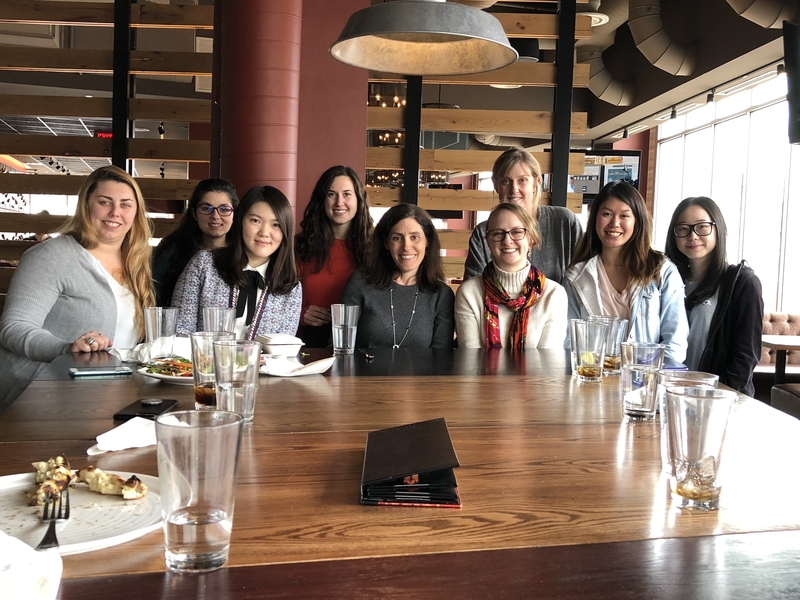 Dr. Robin Nabi had lunch with our Media Psychology Lab members before her Pockrass Lecture about media use and stress relief. Dr. Brian Southwell talked about his research regarding health and science misinformation for our Spring 2018 Science Communication Speaker Series. I had a great group of graduate students for my first ever graduate seminar course. The class tackled topics related to health communication and health-related media effects. 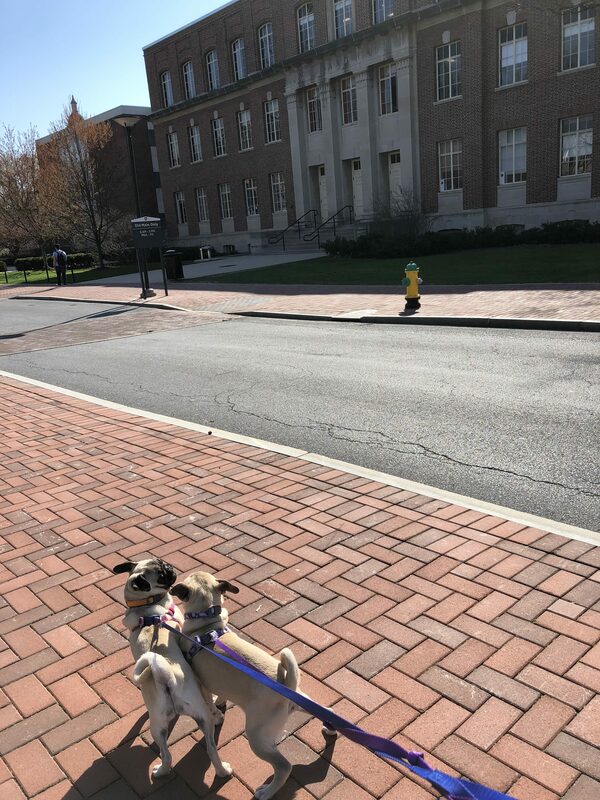 Pancake and Gilly made their first trip to University Park at the end of the 2018 spring semester to bring stress relief to students and faculty during finals week. Ebola has been at the forefront of news coverage around world for nearly six months now. Why exactly are Americans so afraid of a virus that is not airborne and that is almost entirely contained to three small countries an ocean away? As someone who studies health-related media for a living, my research interests automatically point me to media portrayals of the disease. Few of us have ever been to any country in sub-Saharan Africa, but millions of us have seen the movies Outbreak and/or Contagion, and by now we have all seen news reports of great suffering and death due to Ebola. That alone is enough to make the virus particularly frightening. The reality, though, is that we are much more likely to die from seasonal influenza, which kills anywhere from 3,000 to 49,000 Americans every single year, according to the Centers for Disease Control and Prevention (CDC). Health communications scholars have long studied the effects of portraying diseases as frightening on audiences. Fear, while useful for motivating humans to flea when a giant bear is approaching or fight when a weaker individual is attempting to steal one’s mate, is not necessarily the most productive feeling for helping us deal with modern health threats. For a brief example of the reliance on fear in reporting stories about Ebola, let’s look at a recent segment on CBS This Morning. Hosted by Charlie Rose, Norah O’Donnel, and Gayle King, the show often includes health segments with CBS News Chief Medical Correspondent Dr. Jon LaPook. On Monday, October 6, the show featured a story by LaPook with the latest updates on the spread of the Ebola virus. The doctor wanted to help alleviate public fear of the virus given the extremely low risk it presents to Americans by discussing other health threats besides Ebola. “And I would just say this: We all have worry buckets and it’s always right up to the top…” At that point, co-host O’Donnell cuts him off. “This is Rabbi LaPook, everyone!” she riffs, receiving laughs from the other co-hosts. The one medical professional in the room tries to continue his plea for a balanced approach. “This is not the time to have magical thinking. You have to believe in science. And if you are in Boston…” But again, O’Donnell interrupts. “Let me challenge you on that,” she injects, and returns the focus to how frightening the disease is. Don’t get me wrong, I am very interested in the Ebola news and hope that the U.S. continues to be a leader in assisting the African nations that need both public health and humanitarian aid. That does not mean that news coverage should emphasize the fear aspect without also providing information on both short- and long-term solutions. The fear frame currently surrounding Ebola is also not likely the most effective way to educate audiences about the disease. Research on media effects tells us that once news audiences become afraid, they remember fewer facts reported prior to the frightening coverage. Other research indicates that many people who become scared by threatening health information deal with the fear by tuning out, even moving into denial. Those individuals then miss out any helpful information that might come later. Fear-focused coverage of disease is not just an ethical quandary for news organizations; it is also likely to have a negative impact on individual and public health. Just as you can take steps to reduce your risk of for numerous health threats (e.g., wash your hands frequently, stay home if sick, voice support for legislation that funds health and medical initiatives), news outlets can also take control and consider adding more context to their reports on the disease. They could do so by including historical perspectives and interviews with experts. But as Dr. LaPook learned the hard way, one expert on a news program may not be enough to combat the frame of fear. In the end, it is up to consumers to become risk literate, be their own health advocates, and lobby for any changes they want to see in how our society handles health threats.